Our third website launch this month returns us to an area that has represented almost half of the overall sites we’ve built over the years — the small-to-medium sized law firm. When Blake Scoggins Law approached us, they knew our history and the portfolio of work we’ve done for firms all across North Georgia and Atlanta. We have a deep understanding of requirements for these kinds of websites and are comfortable guiding clients through the requirements gathering phase, content acquisition and launch. As with many businesses, most lawyers know how to navigate the legal system, but when it comes to creating an online presence, it suddenly becomes a daunting task. The competition alone requires a best-practices design approach. One doesn’t build a quality law firm site by using cookie-cutter boiler plates, build-your-own free sites or any of a number of blog-based web engines. Knowing how to properly build a site to maximize search engine optimization (“SEO”) while providing a unique and customized look is why so many law firms have abandoned their current providers and have come to AJS Productions. 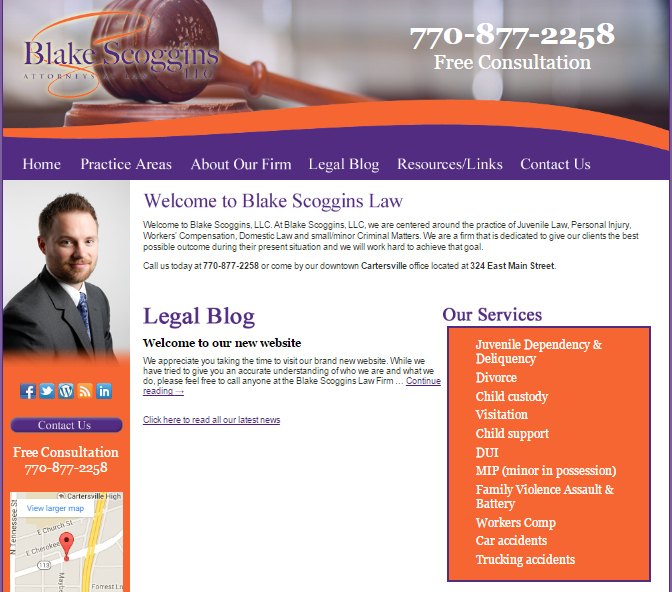 We thoroughly enjoyed working with the folks at Blake Scoggins Law on creating an easy to navigate, yet informative website for both existing and new clients. We wanted to make sure everyone knew their firm strives to protect the interest and rights of each and every person who walks through their doors. They are not afraid to step up to the plate and go to bat for their clients. Their concentration is centered around Juvenile Law, Domestic Law, Personal Injury, Workers’ Compensation, Simple Wills and small Criminal matters. As their firm grows in both size and scope, we will be there every step of the way to make sure their online home is current, relevant and meets the expectations of a tech-savvy public for both desktop as well as mobile computing users. We always make sure our sites are cross-platform and cross-browser compatible, putting emphasis on substance and clarity over flashy designs with cluttered navigation. If you would like to setup a meeting with us to discuss your current site or building a brand new one from scratch, we would love the chance to earn your business. Contact us today to get started. 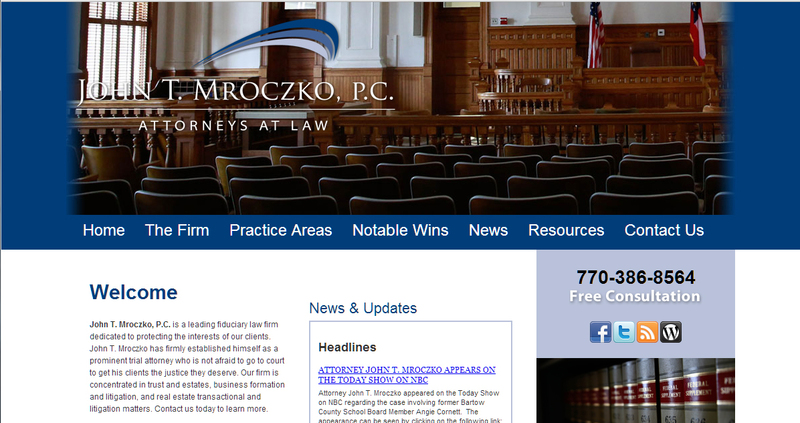 We are very pleased to announce that our latest website development client, John T. Mroczko, P.C. – Attorneys at Law, has their brand new website up and running. You can visit this law firm’s online presence by going to www.georgia-probate.com. They are a leading fiduciary law firm dedicated to protecting the interests of their clients. John T. Mroczko has firmly established himself as a prominent trial attorney who is not afraid to go to court to get his clients the justice they deserve. Their firm is concentrated in trust and estates, business formation and litigation, and real estate transactional and litigation matters. We were excited to have been selected to partner with John T. Mroczko, P.C. – Attorneys at Law and look forward to continuing to be their website partner as they grow their firm. This site required a host of skills to be utilized in its creation, from a brand new logo design and branding to the custom photo shoot, every aspect of this site was created from scratch with the client’s business firmly in mind. At AJS Productions we build your website from scratch. From the initial contact to the day we launch your new site, we’re there every step of the way. We start with an actual meeting with an actual person: a discovery session designed to bring your ideas to the page. We follow it up with a series of web designs and we won’t start to code your site without your sign-off. In fact, we have built in checkpoints throughout the project to make sure you are involved every step of the way. What you’ll get is more than custom, it’s personalized. AJS Productions. Go Social. Go Everywhere. We are so pleased to be able to take a few moments to announce the lauch of our latest client — SPMH Law, LLC. The law firm of Slover, Prieto, Marigliano & Holbert, LLC. has been an exciting project for all of us here at AJS Productions. Though a new firm by name, the experience of the senior partners amounts to over one hundred years of legal practice and courtroom activity. Collectively, they have tried well over 500 cases and have participated in hundreds, if not thousands, of mediations, arbitrations, and settlement conferences. Our attention to detail, focus on SEO marketing and social media integration is what gave us our first opportunity to make a pitch for why they should choose AJS Productions. After learning about our business strategy and the services we offer, they decided to put their faith in us and today is the day to pop our virtual champagne corks. 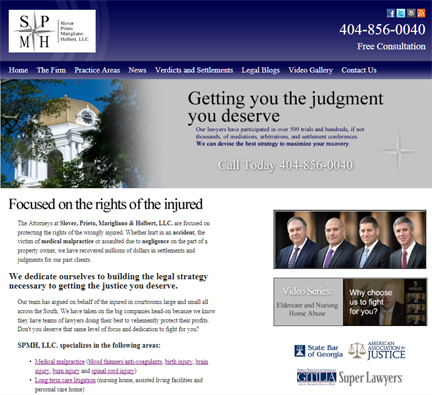 For those who are looking for a personal injury firm that puts the rights of the injured first, then we suggest giving the attorneys at SPMH Law, LLC. a call for a free consultation. In fact, as personal injury lawyers, they will never ask their clients for any out-of-pocket expenses if they take the case. They work solely on a contingency fee basis — if they don’t win, you won’t have to pay a dime. And, for those who have been sitting back for too long without a website, or a site that has been gathering dust for far too long, make an appointment today with us. Much like SPMH Law, LLC. we will never charge a client for our consultation time. Until we have an executed website development contract, there are no fees charged by AJS Productions.